Rabbi Binyomin Pruzansky knows how to find a great story, and how to tell a great story. Just ask any of the thousands of readers who eagerly await his marvelous collections of true stories. 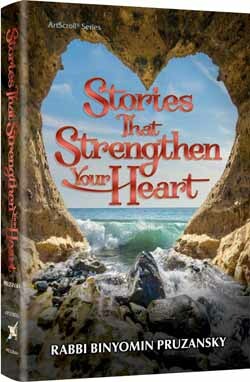 In Stories That Strengthen Your Heart, we will hear about how a little boy's prayers and simple trust saved his "miracle" baby brother, and how a stranded air passenger listens to Hashem's "message" and gets the flight, and the faith, he was missing. In a hospital room and on a boardwalk in Florida; from a monastery in the Far East to a professional basketball court Â– here are more than 50 stories to inspire us, entertain us - and give us strength when we need it!